Although the world may dream of shiny new futures, images of the past still captivate many of us – images such as a now faded-from-use shop seen in its prime, overgrown amusement parks overrun by laughing and smiling children, and abandoned houses that will never again serve as a home inhabited by a loving family. I often walk the Denton Square in Texas, longing to know what it would be like to watch the history of it unfold before my eyes, like Casey Affleck’s apparitional character in A GHOST STORY. In some cases, history deserves more than being a mere page in a text book. It deserves to be seen. It deserves to be felt. The Criterion Channel on FilmStruck relates to the sentiment. The Criterion Collection is all about preserving film that would otherwise be lost. Its channel showcases all sorts of programming that educates us on cinema’s history. On Monday (7/9), the Criterion Channel is airing a special episode of ART-HOUSE AMERICA, an original series that highlights legendary art-house venues across the nation. 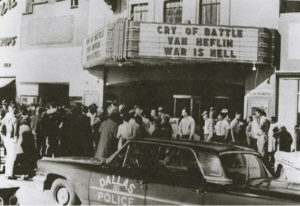 The episode will dive into the history and fascination of the Texas Theatre in Dallas. 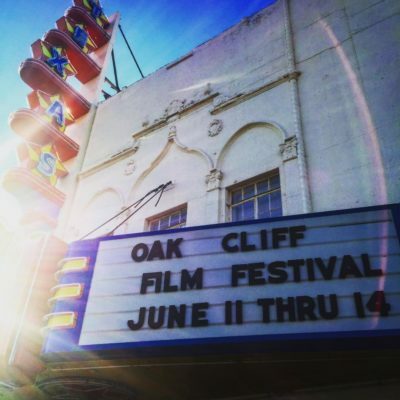 Through interviews with the theater’s team (including operator Barak Epstein, operations manager Mary Katherine McElroy and creative director Jason Reimer, a University of North Texas graduate), archival images and recent footage (look out for Devin Pike, a big advocate of the Dallas film scene), we explore how the Texas Theatre came to be. It opened in 1931, was financed by American business magnate Howard Hughes and became famous (or infamous) for being the spot where Lee Harvey Oswald was apprehended following the 1963 assassination of President John F. Kennedy. Even though the documentary is more of a brief portrait than a full-on painting (it’s only about 10 minutes in length), so much can be learned and so many moments hit you in the feels. To bear witness to photos of the aftermath of fire in the 1990s, and to learn there were rumors the cinema would become a furniture store, is magical. Especially if you’ve been in the revived movie house — where you can take in its classic theater appeal, smell its seasoned aroma and catch a unique screening or live performance. The cherry on top? To see how involved the current theater operators are in the community just beyond the famous marquee. The Texas Theatre is more than a movie house. It’s a performing arts destination for ballets, music and performance art. (Denton’s original Halloween musical, CIRQUE DU HORROR, spent one year at the Texas Theatre, right as the show planted the seed that became Denton’s Day of the Dead Festival.) Denton has special interest in the Texas Theatre, too. Not only is Reimer a member of the iconic Denton Americana band the Baptist Generals, but the owners of the Texas Theatre are reviving the Fine Arts Theatre on the downtown Denton Square. The documentary will give some insight into how the company thinks and what could be in store for the city’s old movie house. To add icing to the cake, ART-HOUSE AMERICA also pairs its episodes with a film that is hand-picked by the theater team they are focusing on. The Texas Theatre, because it caters toward a diverse community, befittingly picked Chris Marker’s 1962 film LA JETEE, a French- and German-language romance drama about a man who (ironically) explores his memories in the wake of war, all told through a series of images. So now… how can you not be romantic about cinema? Access to FilmStruck and the Criterion Channel is $10.99 per month, or $8.25 if you pay all at once for the year. You can also enjoy a 14-day free trial by signing up on filmstruck.com.